The couple's home was opened up for the star-studded world film premier of Sinatra in Palm Springs – The Place He Called Home. (Photo: Jake Holt Photography). The desert mountains that circle Palm Springs are often dusted with a layer of snow. In the 1930s, movie stars of Hollywood’s Golden Age began moving to the desert oasis. With Palm Springs’ Modernism Week in full flight, Kristie Hayden tours celebrity homes and reveals how you can get a glimpse inside. Riding through the empty streets, all of Palm Springs might awake with the rattle and hum of the complimentary hotel bike. In pursuit of the first celebrity home on the list flapping in my grip, I notice that the desert mountains that ring the entire city are dusted with snow. It’s like cycling around the bottom of a margarita. The cycle takes me past the former homes of Elvis Presley, Elizabeth Taylor and Clarke Gable, followed by Bob Hope, Dean Martin, Spencer Tracey and many more. It’s nostalgic to say the least, yet, I have to admit, I’m more enamoured by the beauty of the neighbourhoods, the smell of the gardens and the fresh mountain air. For travellers who love to flick through a lifestyle magazine on any given Sunday, cruising the vibrant palm and bougainvillea-lined streets of Palm Springs will put you right between the glossy pages. In the 1930s, when movie stars of Hollywood’s Golden Age began engaging architects in the desert oasis, their brief was clear: Make it exuberant. Make it as far removed from our handsome Beverly Hills mansions as possible. Let us live out our fantasies here. 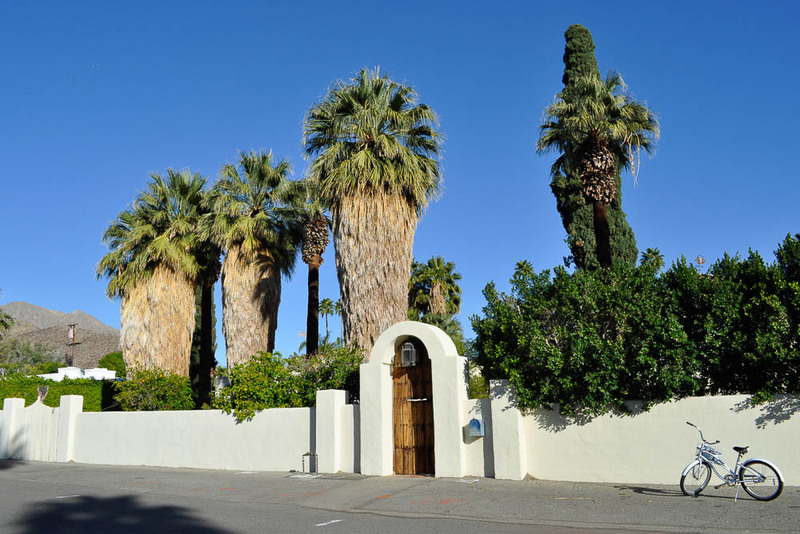 Locals call it the Palm Springs’ school of architecture, where designers enter the city and drop their previous styles to allow the desert to inspire new ideas. 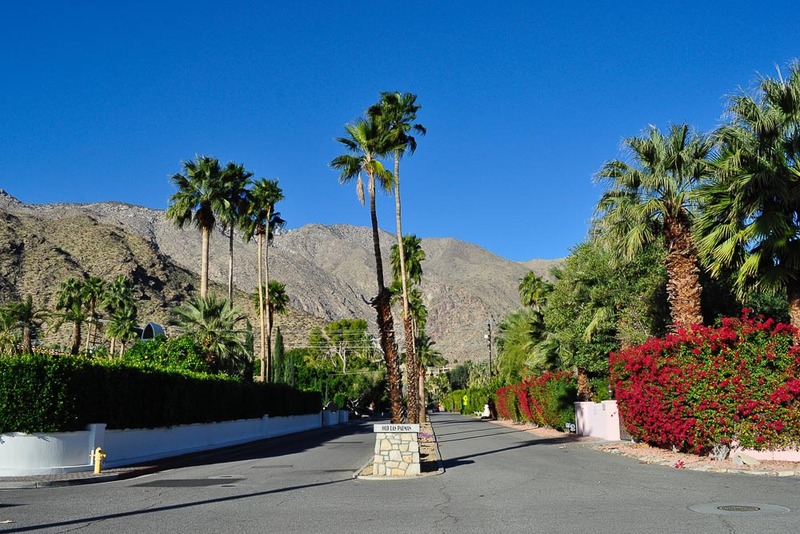 Palm Springs’ modernist design is largely influenced by the environment and botanic landscape. You see it in the sea of flat roofs that mirror the valley floor, the peaked roofs that mimic the summits, and the huge windows that frame the mountain-scapes. You also see it in the bold use of colour on homes, front doors and in furnishings; splashes of vibrancy that bridge the gap between kitsch and fine art and honour colours from native flora under an impossibly blue sky. I’m on the inaugural trip for a Melbourne-based tour company, DAAC Travel, to experience the best of mid-century design during Modernism Week. We’ve had a stellar line-up of events so far, with access to the most sought-after festival tickets – including visits to several mansions of architectural significance across the valley, and a bevy of exclusive cocktail parties. Residents open their doors to showcase perfectly preserved mid-century homes with open-planned living embellished by sparkle, silver and a whole lot of shag. We’ve toured homes with elaborate sculptures, mirrored ceilings and striped floors. We’ve seen opulent Grecian temples, rambling Tuscan villas and, of course, the Palm Springs’ iconic modernist styles that rebelled against austerity. Their doors disappear into walls, their bars are house-central (and sometimes revolving) and their swimming pools are on their doorsteps. While the cycling tour has me chasing ghosts, we’ve also toured country clubs and neighbourhoods revamped in all the colour and brilliance of mid-century design. Interiors are kitsch and flamboyant; think Mad Men with a big splash of Zsa Zsa Gabor. We attended a compelling presentation by leading interior designer Martyn Lawrence Bullard; whose client list includes Cher, Ava Mendez, Tommy Hilfiger and the Kardashians. We joined the star-studded world film premier of Sinatra in Palm Springs – The Place He Called Home. We’ve also visited Cheetah from Tarzan at his humble mid-century residence. Yes, he’s still breathing and receiving visitors. 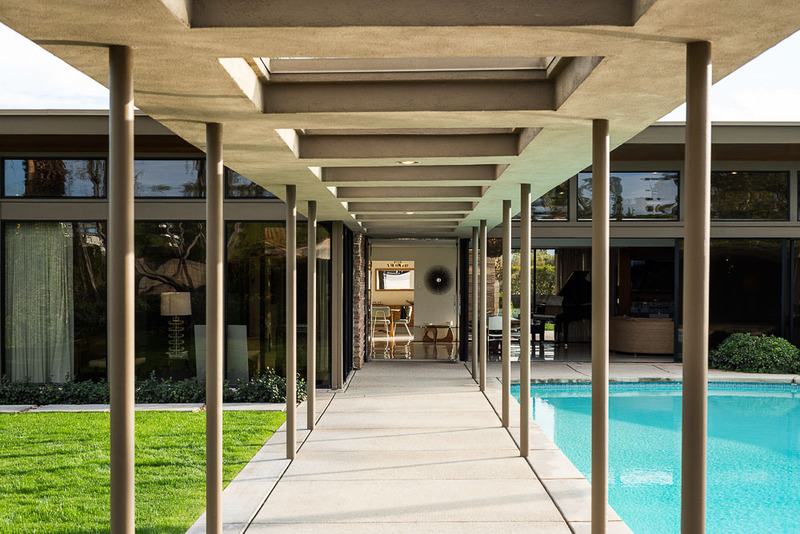 The most exciting event by far was hosted at the 1964-built former home of Hollywood starlet, Dinah Shore, currently owned by actor, Leonardo DiCaprio. Sunset drinks at Leo’s was not something I thought I’d ever boast on my Instagram feed, yet there we were and, my, I did. The Hollywood star’s entrance hall was buzzing with lucky ticket holders. Elegant tunes from a grand piano drew our group through to the reception space and as we rounded the corner, the smiling pianist gave us a knowing nod and we were stopped in our tracks. The sprawling lounge room before us was mid-century mod in a glitzy Charlie’s Angels kind of way. There sat a chrome-edged sunken bar, a mammoth gas fireplace and floor to ceiling windows that framed oceanic lawns on either side. A wander through the home revealed conversation pits and cushioned nooks, grandiose bathrooms and bedrooms fit for royalty. While Leo wasn’t in residence, guests summoned his presence as they explored his pad and lay, yes lay, on his regal bed. Get going: For travel experiences steeped in design, architecture, art and culture, enquire with Melbourne based DAAC Travel. Location: Palm Springs is located on the western edge of the Coachella Valley within the Colorado Desert, approximately 201 kilometres east of Los Angeles International Airport. Festival week: Palm Springs’ Modernism Week is held every February and celebrates mid-century art, architecture and design.